Thanks to Flo Neville, an Autistic Nutritional Coach, who was our Guest Speaker at Wednesdays Post-Diagnostic Support Group. Her excellent talk included how stress hormone imbalance can affect short term memory, mood regulation, planning and organising; regulating our behaviour and making good judgements. Meanwhile, a lack of quality sleep is a common challenge both for those who are autistic and those who live with them. 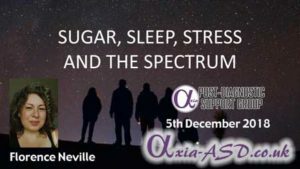 This talk includes an overview of the physiology of stress hormones and provides an achievable set of routine and dietary strategies which can make all the difference between being wide awake during the night and sleeping soundly; and which also significantly reduce anxiety levels during the day. Due to the recent problem of my phone failing to record the audio at a recent PDSG, I attempted to adopt a “belt and braces” approach by having a secondary recording device. Unfortunately my phone failed again, and the secondary audio recorder did not work as well as I’d hoped leaving me with my trousers around my ankles once more! The audio for this presentation is mostly all audible with a little concentration. Any suggestions on what equipment could prevent this in the future would be appreciated. Huge thanks to All the Team at Axia for yet another superb meeting and an outstanding speaker. Flo Neville was full of information and very inspiring. If you look on her website ( google Flo Neville Nutritionist) you can subscribe to receive free newsletters and also, a free ebook entitled “How to Sleep”. This book contains much of what Flo talked about at the meeting. I found your presentation very helpful and really enjoyed you being at the Axia meeting.